UPDATE: This event has been moved from Saturday, April 20, 2019 to Saturday, April 27, 2019 due to inclement weather. 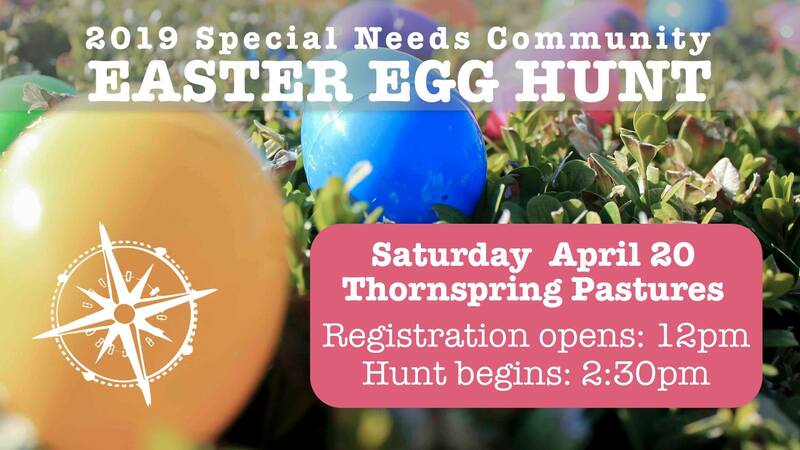 Northstar Church Pulaski presents their First Annual Special Need Community Easter Egg Hunt on Saturday, April 27, 2019 at Thornspring Pastures. This Egg Hunt will be specifically designed with the special needs children in mind. Eggs will be color coded and filled with unique candy and prizes to fit various needs (i.e. food allergies). Families are encouraged to select the most appropriate section with the specific individual in mind when registering. There will be a separate registration for our special needs hunt. Make sure to look for the canopy tent. We encourage participants to pre-register if possible to help us ensure we have enough volunteers prepared to assist you and yours. To pre-register online, visit: https://northstarfamily.ccbchurch.com/goto/forms/254/responses/new. With this event we hope to establish an ongoing relationship with the special needs community in the New River Valley and hope to provide appropriate supports and an engaging experience with their needs in mind. Note: There will be other egg hunts for various age groups happening at Thornspring Pastures. To view details for the full event, visit: http://www.nextthreedays.com/FeaturedEventDetails.cfm?E=507981. To view the event flyer, visit: https://i.imgur.com/HSYahst.jpg. For more information on the event, visit: or http://northstarpulaski.org/2019-special-needs-community-easter-egg-hunt/ or https://www.facebook.com/events/692365914511415/. For more information on Thornspring Pastures, visit: http://www.thornspringpastures.com/ or https://www.facebook.com/thornspringpastures or call 540-577-2855.